In this paper, we introduce a new three-step implicit iteration process and prove that it is faster than the other implicit iteration processes. We prove some convergence theorem for generalized contraction mappings in convex metric space. We also support our results by a numerical example. M. Abbas, P. Vetro, S. H. Khan, On fixed points of Berinde’s contractive mappings in cone metric spaces, Carpath. J. Math., 26(2) (2010) 121-133. Banach S., Sur les Operations dans les Ensembles Abstraits et leur Applications aux Equations Integrales, Fund. Math. 3 (1922), 133–181. V. Berinde, Picard iteration converges faster than Mann iteration for a class of quasicontractive operators, Fixed Point Theory and Applications, 2004(2004), 97-105. V. Berinde, On the convergence of the Ishikawa iteration in the class of quasi contractive operators. Acta Math. Univ. Comen. 73, 119-126 (2004). S.S. Chang, L. Yang, X.R. Wang, Stronger convergence theorems for an infinite family of uniformly quasi-Lipschitzian mappings in convex metric spaces, Appl. Math. Comp. 217 (2010) 277–282. R. Chugh, P. Malik and V. Kumar, On analytical and numerical study of implicit fixed point iterations, Cogent Mathematics (2015), 2: 1021623. Lj. B. C´ iric´, Rafiq, A., Cakic´, N., & Ume, J. S. (2009). Implicit Mann fixed point iterations for pseudo-contractive mappings. Applied Mathematics Letters, 22, 581–584. Lj. B. C´ iric´, Rafiq, A., Radenovic´, S., Rajovic´,M., & Ume, J. S. (2008). OnMann implicit iterations for strongly accretive and strongly pseudo-contractive mappings. Applied Mathematics and Computation, 198, 128–137. Lj. B.Ciric, Ume, J. S. M., & Khan, S. (2003). On the convergence of the Ishikawa iterates to a common fixed point of two mappings. Archivum Mathematicum (Brno) Tomus, 39, 123–127. C.O. Imoru, M.O. Olantiwo, On the stability of Picard and Mann iteration processes. Carpath. J. Math. 19, 155-160 (2003). A.R. Khan, M.A. Ahmed, Convergence of a general iterative scheme for a finite family of asymptotically quasi-nonexpansive mappings in convex metric spaces and applications, Comput. Math. Appl. 59 (2010) 2990-2995. S.H. Khan, I. Yildirim, M. Ozdemir. Convergence of an implicit algorithm for two families of nonexpansive mappings, Comput. Math. Appl. 59 (2010) 3084-3091. S. H. Khan, Common fixed points of quasi-contractive type operators by a generalized iterative process, IAENG Int. J. Appl. Math., 41(3) (2011), 260-264. J. K. Kim, K. S. Kim, S. M. Kim, Convergence theorems of implicit iteration process for for finite family of asymptotically quasi-nonexpansive mappings in convex metric space, Nonlinear Analysis and Convex Analysis, 1484 (2006) 40-51. U. Kohlenbach, (2004). Some logical metatherems with applications in functional analysis. Transactions of the American Mathematical Society, 357, 89–128. Q.Y. Liu, Z.B. Liu, N.J. Huang, Approximating the common fixed points of two sequences of uniformly quasi-Lipschitzian mappings in convex metric spaces, Appl. Math. Comp. 216 (2010) 883–889. M.O. Osilike, A. Udomene, Short proofs of stability results for fixed point iteration procedures for a class of contractive-type mappings. Indian J. Pure Appl. Math. 30, 1229-1234 (1999). W. Takahashi, A convexity in metric space and nonexpansive mappings, Kodai Math. Sem. Rep. 22 (1970) 142-149. I. Yildirim, M. Abbas, Convergence rate of implicit iteration process and a data dependence result, European J. Pure and Appl. Math. 11 (1) (2018), 189-201. I. Yildirim, S. H. Khan, Convergence theorems for common fixed points of asymptotically quasi-nonexpansive mappings in convex metric spaces, Applied Mathematics and Computation, Volume 218, Issue 9 (2012), 4860-4866. T. Zamfirescu, Fix point theorems in metric spaces. Arch. Math. 23, 292-298 (1972). ISNAD Yıldırım, İsa . "On the rate of convergence of different implicit iterations in convex metric spaces". 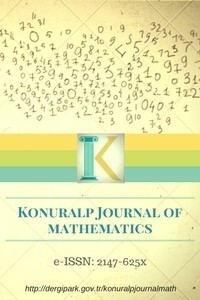 Konuralp Journal of Mathematics (KJM) 6 / 1 (April 2018): 110-116.